Flash videos are very common these days. With the aid of Adobe flash player and Microsoft silverlight internet is now a more lively place. There are a lot of tools and firefox extensions like Flashgot, SWF Catcher, DownloadHelper it is rather easy to download flash videos from Youtube, Dailymotion, Metacafe. These sites also have lots of free songs which many of us like to grab. 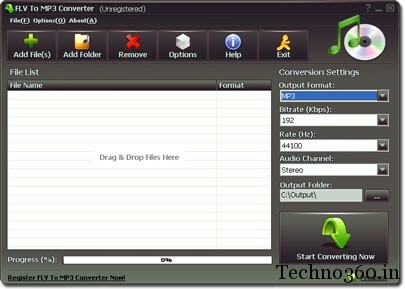 FLV To MP3 Converter is for them. The software may seem very new but it is from the developers of PDFZilla, PDFTiger, ReeZaa MP3 Converter, PDF OCR Youtube Music Downloader, most of which has been featured several times in Giveawayoftheday. Surprisingly in spite of having so many popular programs the developers are yet to make a common brand name. 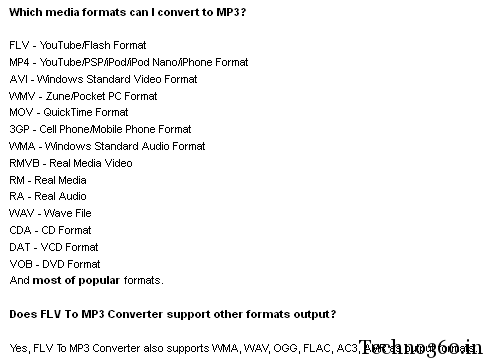 Anyway, here is the quick features of FLV To MP3 Converter. Inspite of its name this app also supports AVI, MPG, FLV, WMV, MOV and more video formats to MP3, WMA, WAV, OGG, FLAC audio formats conversion. Here is a tutorial to use this software. Remember this giveaway lasts only until 25th October, 2011. So about a month left, go grab a copy. This serial is good for all releases of v3. I am not sure if it will work for the higher versions.